MAPKAP Kinase 2 antibody LS-C18843 is an unconjugated rabbit polyclonal antibody to MAPKAP Kinase 2 (MAPKAPK2) from human, mouse, rat and other species. Validated for ELISA and WB. Synthetic peptide from rabbit MAPKAPK2 / MK2. Aa 310-325 of rabbit MAPKAP Kinase 2 conjugated to KLH using maleimide. A terminal cysteine residue was added to facilitate coupling. This antibody is suitable for western blotting and ELISA. Store vial at -20°C. For extended storage aliquot contents and freeze at -20°C or below. Avoid freeze-thaw cycles. Dilute only prior to immediate use. Anti-MAPKAP Kinase 2 Polyclonal Antibody - Western Blot. Affinity purified anti-MAPKAP Kinase 2 polyclonal antibody detects MK2 in unstimulated human HeLa whole cell lysate by western blot. Polyclonal rabbit-anti-MAPKAP Kinase 2 used at a 1:2000 dilution to detect 20 ug of whole cell lysate containing MK2. 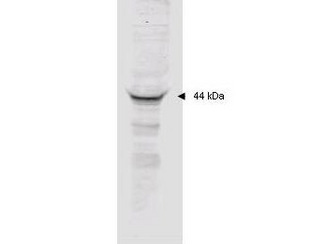 This antibody detects a single 44 kD protein as indicated in crude extracts prepared from either unstimulated or TNFa stimulated human HeLa cell lysates. A 4-20% gradient gel was used to separate the protein by SDS-PAGE. The protein was transferred to nitrocellulose using standard methods. After blocking the membrane was probed with the primary antibody for 1 h at room temperature followed by washes and reaction with a 1:5000 dilution of IRDye800 conjugated Gt-a-Rabbit IgG [H&L] (code for 30 min at room temperature. LICORs Odyssey Infrared Imaging System was used to scan and process the image. Other detection systems will yield similar results.